Massive Savings if you add these Courses to your Order NOW! What if one guitar program could take you from beginner to competent musician with a years’ worth of lessons, tests and backing tracks? 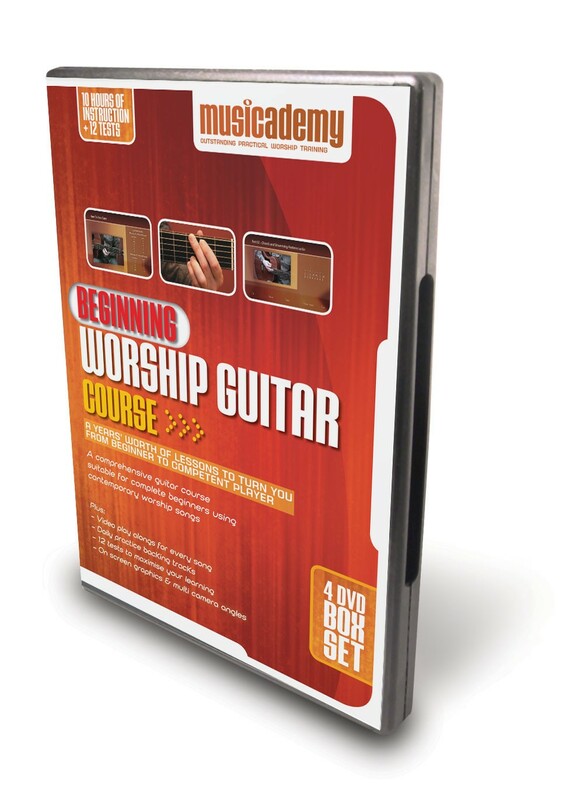 Musicademy's new Beginning Worship Guitar Course is suitable for complete beginners and uses contemporary worship songs. 10 hours of instruction on 4 DVDs with onscreen graphics and camera close-ups. The equivalent of a year's worth of lessons to turn you from beginner to competent player. Here is a description of the difference between the old and new Beginners Guitar Courses. Also available (as a download only) are four extensive practical workbooks. These are designed as optional extras and will help you maximise your learning as well as giving you the main course notes contained on the DVDs in hard copy written format. Each of the four workbooks contains 10 new songs for you to learn alongside the techniques and chords you learn as part of the DVD lessons. For each song we give you a chord chart, a strumming pattern and notes to guide you. The workbooks also contain tests and further exercises other than those on the DVDs. This training course is perfect for the beginner. Musicademy starts from the ground up with the very basics of guitar playing on this all new Beginning Worship Guitar Course. Teaching proper technique this 4 DVD series has the ability to take the learner from beginner to competent player in just a few months. Do not be fooled by this beginner course! Musicademy has done a great job of creating a very hefty bit of learning in these 10 hours of guitar lessons. Along the way tests are provided to increase learning and challenge the student to excellence. Musicademy also offers backing tracks to play along with that will help train you to listen to the musicians around you while playing in a band setting. Online resources are also readily available. This program is perfect for worshipers of any age who desire to become efficient with a guitar. Beginning Worship Guitar Trailer (2012) from Musicademy on Vimeo. My Soul Sings – Delirious? This Beginners series is suitable for complete beginners and will take you to a stage where you can play worship guitar confidently in a house group or small church setting. If you think you are a bit too advanced for the Beginners Box set (i.e. you already know plenty of open chords, power chords and basic finger picking), then have a look at our Song Learner Series which sits between Beginners and Intermediate in terms of ability. Apart from the DVDs and a DVD player (or computer), all you need is a guitar, a pick (plectrum) and ideally a tuner. Although not essential, lots of people find our DVD workbooks a helpful guide to use alongside the DVDs. With these you have the chord charts printed out beside you, rather than just on screen.The workbooks will help you work through the DVDs as well as showing you further songs to play using the chords and strumming patterns you have learnt. Is this for electric or acoustic guitar? The Beginners series is suitable for both acoustic and electric guitarists. Having learnt the basic information on volumes 1-3 you can then progress to our song learner series (more suitable for acoustic players) and our Intermediate Acoustic or Intermediate Electric DVDs. What else is available to help me practice? We have a DVD called Worship Backing Band - Musicians Practice Tracks which contains 54 worship songs that you can play along with. Practice is a lot more fun with other people! You can select to take the vocals out of the mix so you are effectively the singer with a pro band. Its like high quality worship karaoke. The DVD shows on-screen words and chords so if you play an instrument you can also play along as you sing. Will the DVDs work on my DVD player? The DVDs are NTSC and coded Region 0 which means they will play anywhere in the world. Can I get a refund if I don't like the DVDs? Yes, you are also covered by our 100% customer satisfaction guarantee if having received the DVDs you do not feel they are right for you. I really appreciate the way you "teach" guitar. I picked the guitar up in my mid-30s but being left handed and for other reasons I stopped trying to play it. I have been using your beginner course and find it very useful. I wish I had found your courses many years ago but that is the way it goes sometimes. I hope to continue with your other courses as time goes by. Thank you kindly for your great work and the efforts of Musicademy!!! If you are interested in picking up the guitar and learning to play it this resource is one of the best. I went through many other resources similar to this and found this worked best for me, just saying! I bought the product as I have given up learning playing the guitar after learning it myself for many years. I got to the point where I found it hard to improve any further without any structured lessons. I have now bought the CD for over six weeks. I found that it is an excellent product, as it allows me to go back to basics, pick up things that I have been doing wrong, and learn many new songs. It is good value for money as you are learning from a top guitarist. It is not only suitable for beginners but anyone who have been learning for many years and want to improve their playing. I would strongly recommend it along with the workbook. The main tool I use for Guitar is my ipad, and I can not use your product on that device, I have also bought the songbook and suspect I will have to buy the backing tracks as well, all of which should be a single product downloadable for use across different platforms. That's the niggle out of the way and while serious enough to give low ratings there is a really good product here, it is enjoyable to use, and I feel that I am making progress, the lessons are well thought out. One product working across multiple platforms would get 4 and 5 star ratings from me. Thanks for your review and feedback. Obviously DVDs are not going to work on ipad but we do have products available for download which do (eg the new Worship Guitar Collection which is download only). We are experimenting with formats and platforms but we find that the vast majority of customers currently prefer the physical DVDs. 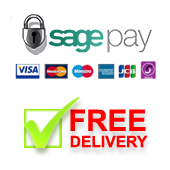 Our preference would be download only as the physical products are expensive to create and ship. 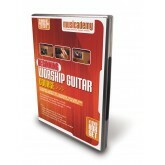 The Worship Guitar Collection is a great price as we don't have any DVD production and shipping costs to absorb. We will be making most of our current DVD products available as downloads over the next couple of years. In relation to the workbooks and backing tracks. Yes, we would much prefer to have people have them all. It makes for a complete learning package. However doing that and packaging them together might put the price above what many people can afford. We pay A LOT for licensing for the large number of songs on these. That's one license for the DVDs, one license for the workbooks and one license for the backing tracks. That's before we take into account the costs associated with creation of the supplementary products. Obviously we do need to recoup those costs but want to keep the prices as affordable as possible which is why we separate them out as separate products. We really don't "make" money on the supplementary products. These just about pay for themselves. This is an excellent product. The methods are easy to follow yet effective. I have given up on guitar several times, but this product now keeps me going. I have just started the second DVD, but I am already applying the methods learnt to play other songs not included in the DVD. It is a great product, and the methods are innovative. Thank you very much, Andy and the team. Having received requests from a number of wanting to also learn the basics of guitar playing, I leant it out and always received it back with the it being so highly rated, they purchased a copy of their own copy to keep stating "it's such a fantastic resource!" and "I've used it again and again and have really noticed the difference in both my confidence and ability to play!" For those starting out or those looking to brush up, this is indeed a great resource and comes highly recommended. playing the guitar is not an easy task but you guys video on the beginner series help me to understand the basics and build a solid foundation from there. the lesson was very very informative and instructive i liked how Andy took time out to show not only where the finger should go on the frets but how to get a clean and beautiful sound from the guitar. i would recommend this series for any beginner looking to get their feet wet because it will have you playing well in little time!! I love how these guys are always looking to help keep things simple but also sounding the best. Thanks once again. I have tried other DIY type guitar books and courses with no luck, but with Musicademy it made something click. Not sure what it was but it made playing the guitar easy and that is saying something for someone as non musically inclined as I am! I have recommended any of their resources to people and have heard how happy they were with their products (had former student of mine buy the keyboard DVD and another one buy the drums DVD). Great work putting these DVDs together to teach people how to play the various instruments. Would highly recommend you look into it!